Some college course work completed. 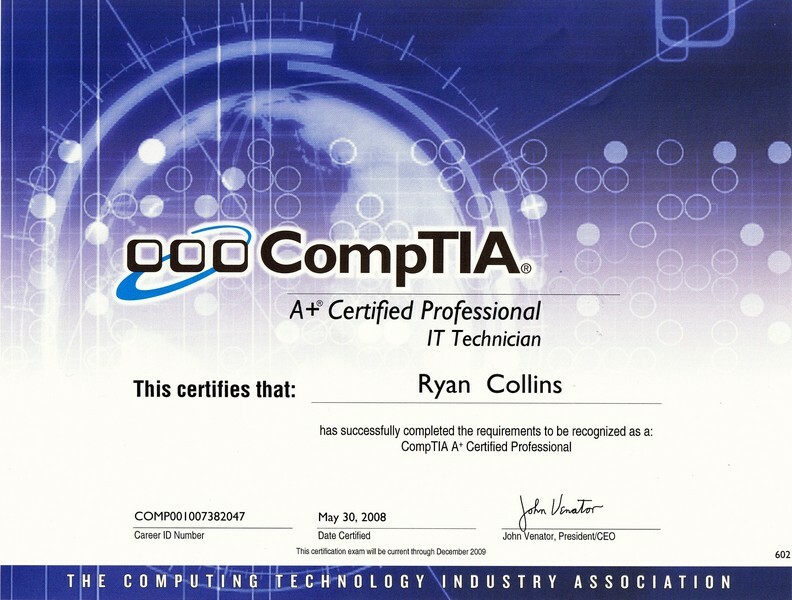 The Network Administrator track provided the required knowledge confidence and skill sets through a balance of lecture, discussions and hands on experience to plan, administer, support and troubleshoot computer hardware, Windows XP, Windows 2003 Active Directory and Windows Networking systems. Installing and supporting Windows XP/Server 2003 and MS Active Directory. Basic configuration of the Desktop and IE. Configuring, managing, and maintaining hardware. Creating users and groups in a domain and on local machines. Managing a network with local and group policies. Plan, design and deploy network environments. Basic understanding of security, printer management, monitoring server performance, troubleshooting and disaster recovery. 60 Credit hours towards Criminal Justice Associates Degree. Qualification in and possession of AFSC 3P031are experienced in SF functions such as weaponry; controlling entry into and providing internal control within installations and restricted areas; response force tactics; air base defense concepts and procedures; terrorist threat response techniques; alarm monitor duties; control center duties; traffic control; patrolling; or accident investigation. Mitigating losses by conducting on-going reviews of all operational systems and business metrics to identify existing or potential exposures. Implementing and maintaining all Loss Prevention programs to provide a path to educate management and associates in the causes of inventory shortage and safety related losses, and the methods by which they can be prevented. Working with store management team to monitor all controllable expenses in the unit by conducting on-going reviews to ensure financial resources are utilized appropriately to reduce expenses when possible. Ensured investigations were conducted and successfully concluded involving internal and external theft and violations of business conduct policy through the use of exception reporting, undercover security and CCTV Intellex based Digital Video Management Systems. Increased overall Retail Theft apprehensions by approximately 120% over previous year end results. Exceeded nearly all year to date metrics, shrink goals and expectations. Personally executed all aspects of store Loss Prevention Operations by identifying and analyzing risks in order to effectively develop, recommend, and implement comprehensive countermeasures to eliminate and minimize losses; cultivated an effective store level Loss Prevention culture through ongoing training and implementation of Loss Prevention theory. Held key position as the District External Theft Coordinator; collected evidence and intelligence for theft trend analysis from 11 locations in various markets throughout Utah, Colorado, Nevada and Idaho. Developed new reporting procedure hastening the speed of valuable information; procedure was later implemented company wide. Identified, investigated and resolved 9 internal and 275 external theft issues recovering $31,158.67 in company assets over a 17 month period. Chosen as the Loss Prevention Outstanding Performer, third quarter 2006. Assisted with investigations as directed by lead investigators. Gathered and complied information for lead investigators by conducting surveillances and investigations. Located and served target individuals, businesses and entities legal documents by way of legal process. Provided due diligence for hard to serve individuals, businesses or entities. Maintained investigative logs and submitted completed case reports. Presented Sprint/Nextel products and service solutions to potential private and corporate clients; provided ongoing customer service to clients, supervised two store locations, maintained and exceeded company sales standards for cellular activations and gross profits. Single-handedly developed new consultative sales strategy which was adopted and implemented company wide; trained sales teams in active listening and sales techniques. Generated $400,111.54 in gross profits and 785 cellular activations through efficient client management, successful sales strategies and effectively marketing products and services at a local level. Consistently remained one of the company's top ten performers. Successfully safeguarded company assets by resolving external theft issues by apprehending and prosecuting retail theft offenders in accordance with local and state laws and company policies. Served as a member of the 75th Security Forces Military Police Squadron (75th SFS), Hill Air Force Base, Utah; deployed as a member of the Air Expeditionary Force supporting military operations world wide. Supervised multiple Security Response Teams (SRT's), preformed law enforcement functions, directed 20+ post and patrols during both normal and contingency operations. Garnered 2004 Outstanding Flight Level Airman of the Year/75 SFS. Decorated with two Air Force Achievement Medals in support of OPERATION IRAQI FREEDOM. 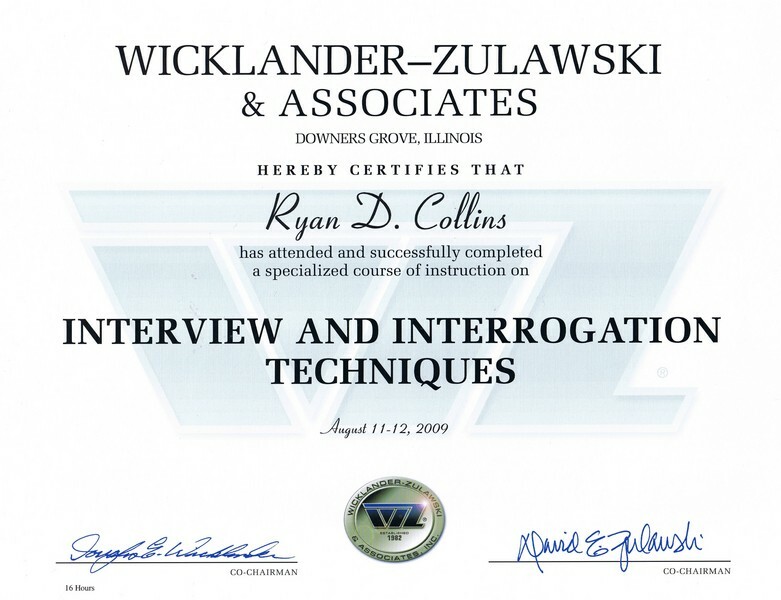 “I have known Ryan Collins as a fellow classmate over the past 7 months. Ryan is organized, efficient, extremely competent, and has an excellent rapport with people of all ages. His communication skills, both written and verbal, are excellent. In summary, I highly recommend Ryan for any position or endeavor that he may seek to pursue. He will be a valuable asset for any organization." Veteran Loss Prevention Manager seeking new challenges with a forward looking company. Chosen as the Loss Prevention Outstanding Performer, third quarter 2006. Mervyn's Department Stores.